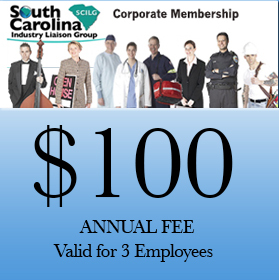 SC ILG Corporate Membership costs $100 annually for three employees. One of the three employees must register with this site before purchasing a Corporate Membership for the first time. Registering with this site allows individuals to receive information on SC ILG conferences and workshops and is separate from membership. Corporate Membership requires that one company employee register and pay the Corporate Membership costs. After dues have been paid for the three employees, the registered employee will have access to licenses to activate the remaining members under their corporate membership. The two other employees will receive log in information via email that includes username and password and will receive email notifications of conferences and other events. Individuals will not need to register again when renewing membership with the SC ILG. Membership includes benefits such as webinars and workshops at no cost for all three employees. Also, all three employees may attend some SC ILG conferences at a discounted rate. Membership expires 365 days from the date of purchase. SC ILG Individual Membership costs $40 annually. Registering with this site allows individuals to receive information on SC ILG conferences and workshops and is separate from membership. Individuals will not need to register again when renewing membership with the SC ILG. Membership includes benefits such as webinars and workshops at no cost. Also, SC ILG members may attend some SC ILG conferences at a discounted rate.